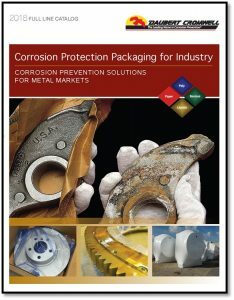 Our new VCI Catalog of Corrosion Preventive Packaging Products now available! We have published an updated version of our comprehensive catalog of corrosion inhibitor packaging products. The new catalog includes our complete line of VCI papers, films, emitters, liquids and powders that protect metal equipment and parts from rusting during storage and shipment. A section on How VCI Works to create a moisture barrier that protects your metal parts from corrosion. Wondering which VCI product to use? Our new catalog includes practical advice on choosing the right VCI corrosion preventive packaging product, depending on type of metal, environmental conditions and duration of storage. User-friendly overviews of our most popular products, including military-approved papers, VCI films and bags, emitters, foam, rust preventive liquids, and rust removers. Click here to download or email info@daubertcromwell.com to request a catalog by mail.